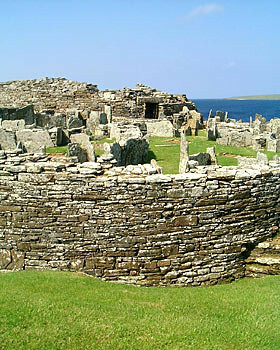 Nine miles northwest of Kirkwall is the tiny village of Evie. 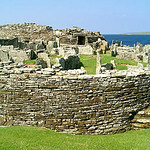 A track leads from the village towards the coast, past a sandy beach, to the Broch of Gurness. To the southwest of Evie is the Birsay Moors RSPB Reserve, and at Lowrie's Water on Burgar Hill there's a bird-hide from where you can watch breeding red-throated divers. Also on Burgar Hill you'll see several huge aerogenerators built to take advantage of Orkney's fierce winds.